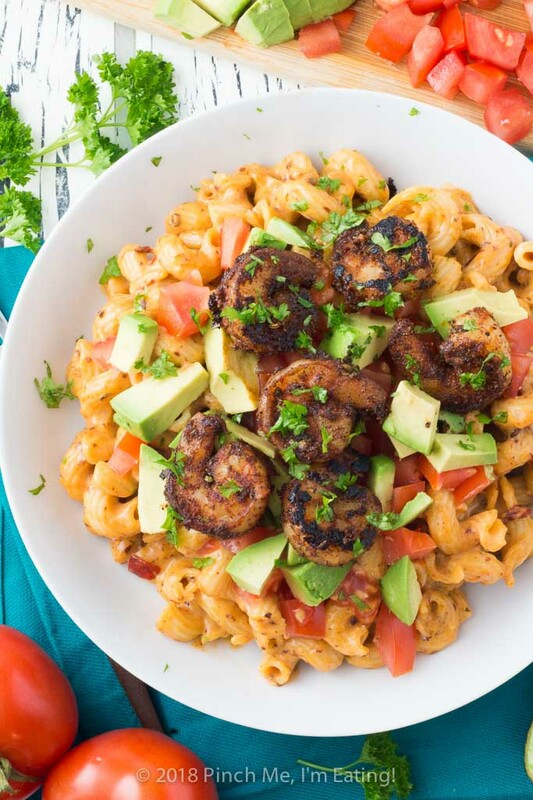 Chipotle Mac and Cheese with Blackened Shrimp | Pinch me, I'm eating! 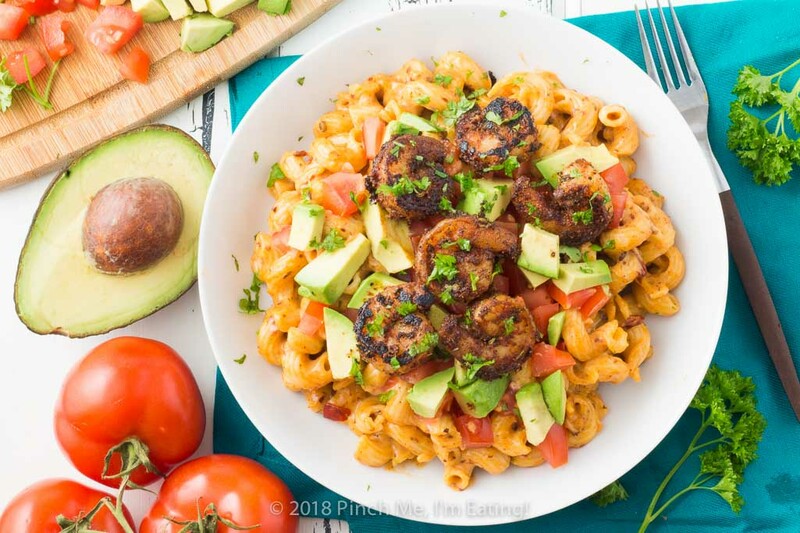 Chipotle mac and cheese is topped with blackened shrimp, fresh tomato and avocado for a colorful contrast of flavors and textures. 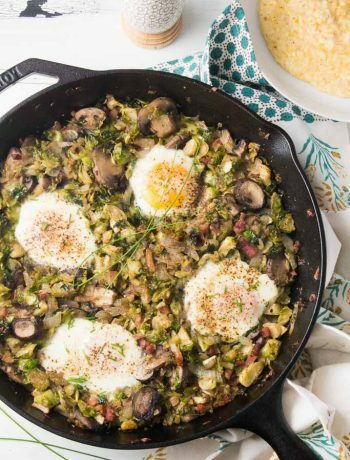 This dish presents beautifully for company and is simple enough for a weeknight dinner! I’ve just discovered that one of my favorite restaurants in Tucson, Delectables on 4th Avenue, closed last summer after 44 years. I used to walk down there from the University of Arizona campus when I wanted a nice dinner out. I’d sit inside at my favorite little round table with the beautiful wood inlay or outside on the patio if the weather was nice, and order the black currant iced tea — unsweetened, incredibly flavorful, and refreshing. For dinner I’d get a fruit and brie board along with the asparagus crepes or the Southwest penne with blackened chicken. Luckily I got to experience it one last time — although I didn’t know it would be my last visit — when I went back to visit Tucson in 2016. I got to bring my husband there for the first time. I had the asparagus crepes and he ordered the Southwest penne so we could both have some of each. It’s truly the end of an era, but all is not lost. 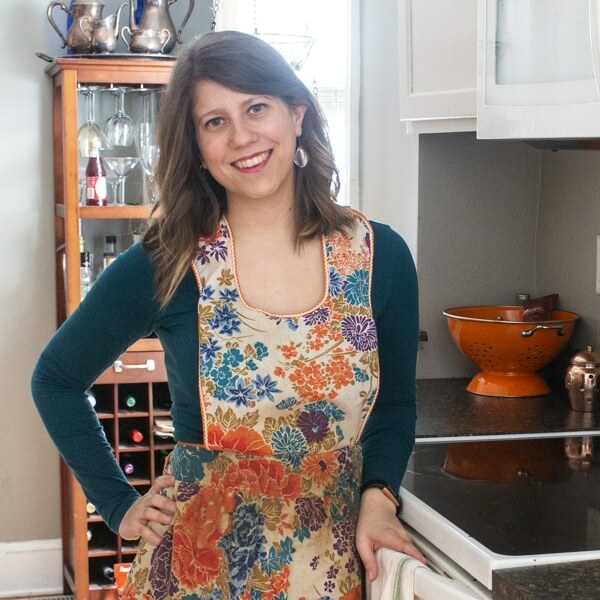 First of all, the chef from Delectables is still cooking, now as a full time caterer! Hit them up if you have catering needs in Tucson for sure! Not in Tucson? 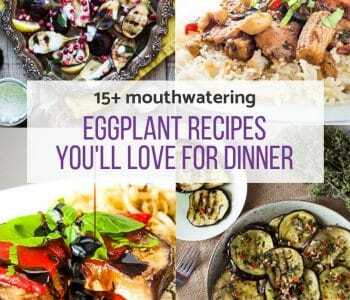 Well then, this recipe is for you. 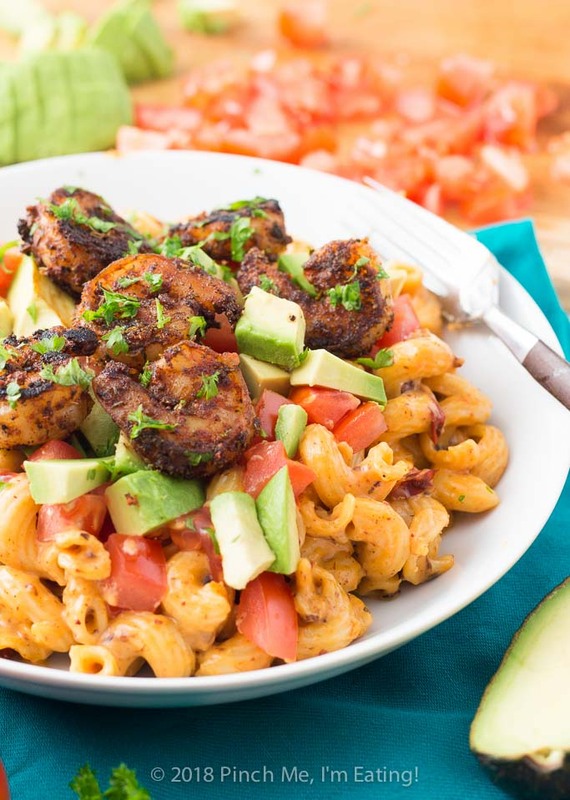 It’s the Southwest penne with blackened chicken from Delectable’s that inspired this flavorful pasta dish: chipotle mac and cheese with blackened shrimp. It’s not exactly the same as what they had there — cavatappi noodles instead of penne, shrimp instead of chicken — but I think it captures the essence. And you can always swap out for penne or chicken in this recipe too! 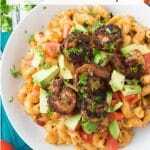 Using cavatappi noodles in your chipotle mac and cheese adds a bit of whimsy, in my opinion. Cavatappi is my new favorite noodle shape – it’s a macaroni noodle, but not cut as short, so the ultimate shape is a delightful corkscrew. Unlike rotini, which some may think of as corkscrews, cavatappi is tube-shaped, making it perfect for capturing sauces. But, if you can’t find cavatappi at your store, rotini (corkscrew but not tube-shaped), penne (tube-shaped but not corkscrew) or regular old macaroni will work for this recipe. 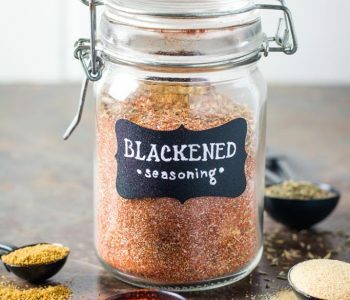 The blackening seasoning is super flavorful and really adds a kick to the whole dish! Add your cayenne pepper with caution – a little goes a long way, so know your tolerance for heat! I used a full half teaspoon when I made it and it was definitely on the spicier side, but the tomatoes do a great job of balancing it out. Next time I might lean more towards 1/4 teaspoon, although my husband always thinks things could use a little more of a kick! Not only does the blackening seasoning coat the shrimp, but you mix some right into the cheese sauce too, along with a whole can of chipotle peppers, so a bold, smoky chipotle flavor permeates the entire dish. 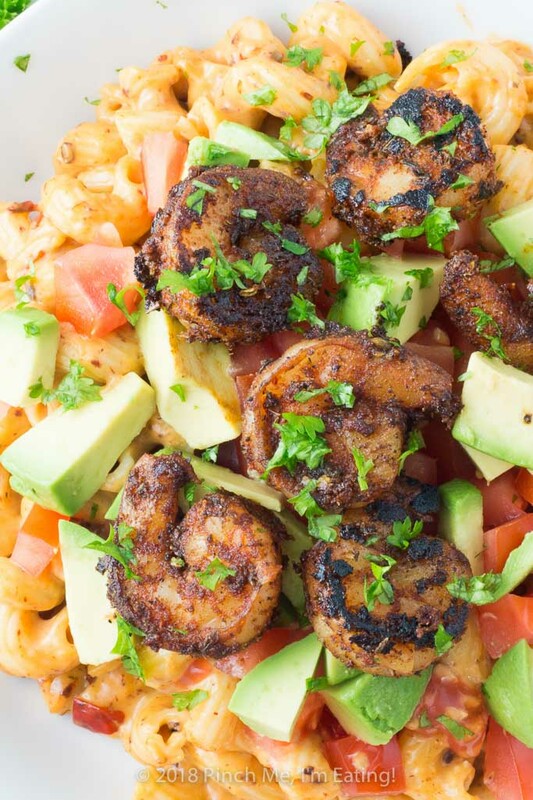 Diced tomatoes and avocado not only add color, but their freshness balances out the spiciness of the blackened shrimp. And I personally love the texture and temperature contrast between the hot pasta and the cool tomatoes. 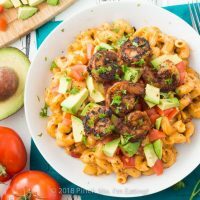 The final chipotle mac and cheese is a contrast between spicy and mild, hot and cool, and is full of riotous color with smoky chipotle flavor throughout. 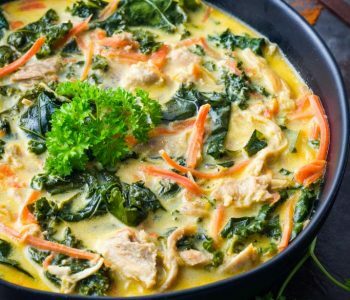 It presents beautifully for company and is simple enough for a weeknight dinner! 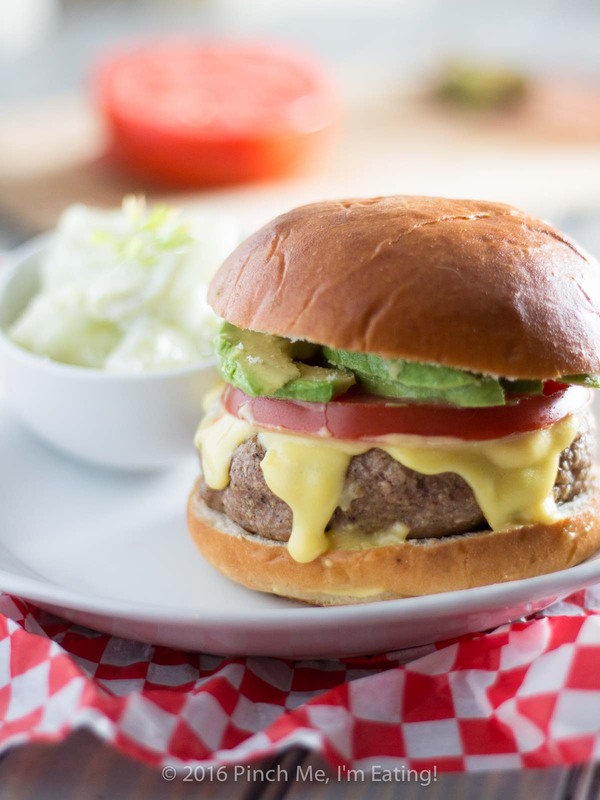 Serve it with a fresh green salad. 2 tsp paprika use smoked paprika if possible! Bring a large pot of salted water to a boil and cook cavatappi pasta according to package directions. 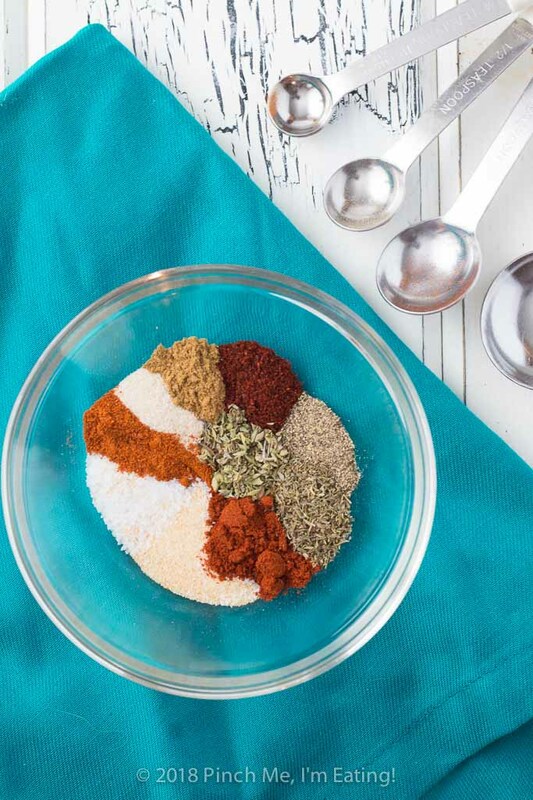 While pasta is cooking, mix together blackening seasoning ingredients. Reserve 2 tsp of the spice blend for later. Pat shrimp dry with paper towels, then toss with the rest of the blackening seasoning in a bowl or ziploc bag. Preheat a skillet (I like to use cast iron) to medium heat (medium high if using non-stick instead of cast iron). Melt 1 tbsp butter and arrange the seasoned shrimp in a single layer. 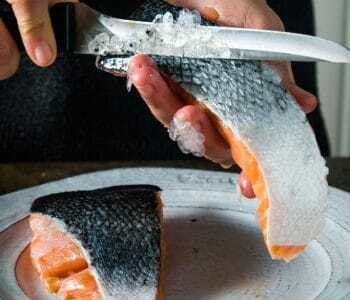 Cook for 2 minutes on each side or until opaque. Remove from heat and cover with a lid or on a plate with foil to keep the shrimp warm. Drain pasta. In the now-empty pasta pot (I leave the pasta in the colander for a bit), melt 4 tbsp butter over medium heat. 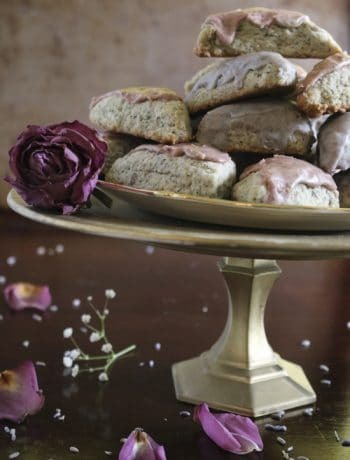 Add flour and stir frequently for a couple minutes or until the mixture takes on a bit of a golden hue. Slowly whisk milk into the roux (the butter-flour mixture) until well combined. The sauce should thicken fairly quickly. When thickened, turn heat to low and add cheese and reserved 2 tsp spice blend. Remove seeds from chipotle peppers and finely chop them. Add chopped peppers and 3 tbsp adobo sauce from the can into cheese sauce. If you like your pasta spicier, you can add some of the chipotle seeds back into the sauce, to taste. Stir drained pasta into cheese sauce. 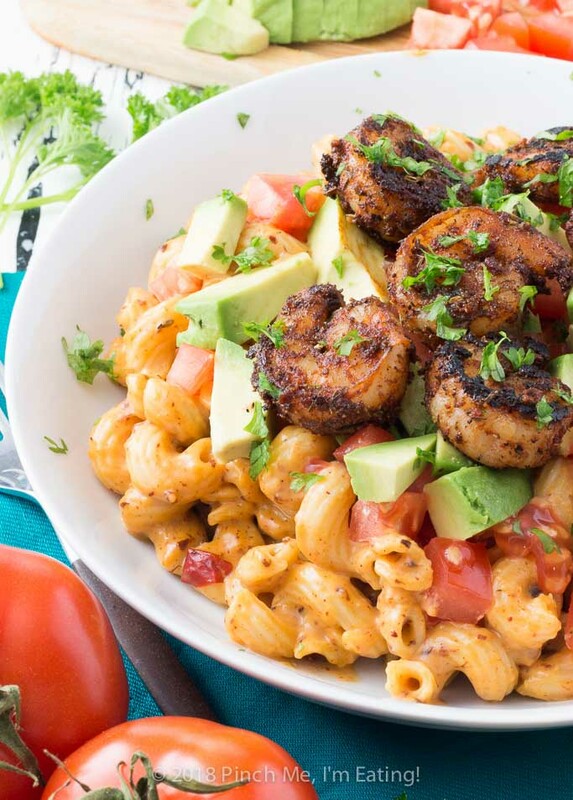 Serve in bowls topped with shrimp, fresh chopped tomatoes, and avocado. Such a wonderful combination of flavors! I just love the color on that shrimp. Yum! Thanks so much! It is such a great flavor! Usually I’m not one to throw a lot into my my mac and cheese but I definitely would for this awesome dish! 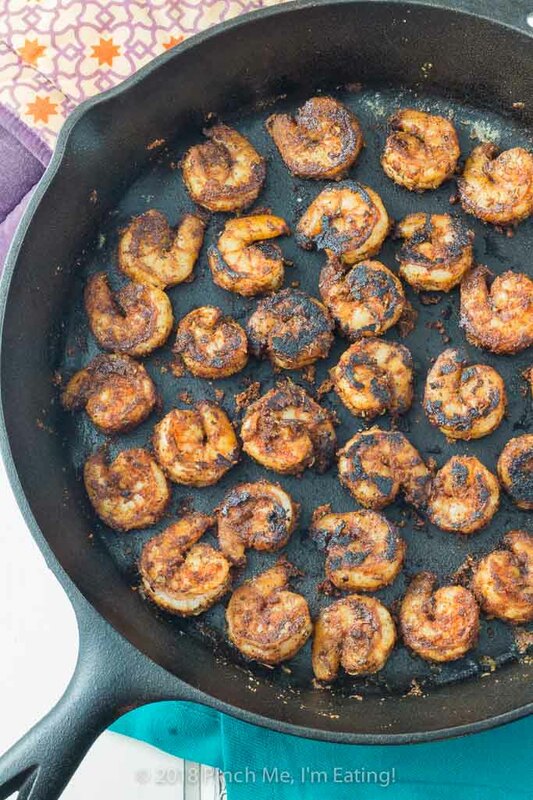 I love the additiion of blackened shrimp! The chipotles can definitely be spicy if you don’t get all the seeds out! 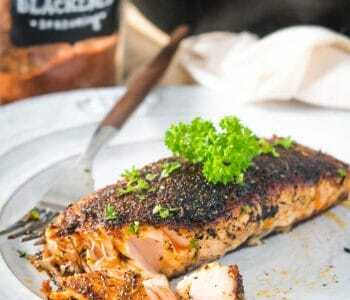 I lovvve blackened salmon so I bet your variation is delicious!